So it was with him, so it is with Distributism. Why? For a comparison, look at her two rivals, capitalism and socialism. Why do they fixate on bigness, whether in government or business? Not everything constructed on a huge scale is necessarily a good thing. When economic giants like Enron or WorldCom crumbled, thousands lost their jobs, savings and futures. When political powers like the British Empire dissolved, the world changed forever for those opposed to its demise. So why the need for bigness? It comes down to the sin that brought down our First Parents in the Garden of Eden. And that is pride. St. Thomas Aquinas defines it as “inordinate self-love.” Dante in his Divine Comedy called it "love of self perverted to hatred and contempt for one's neighbor." 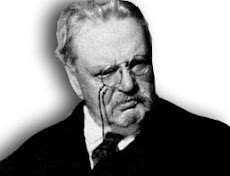 Chesterton describes it as the vice that is “the poison in every other vice.” Since it is root of the rest of the Seven Deadly Sins, it is the core of greed and envy. Capitalism is often accused of fostering these vices, but socialism is just as guilty of them as well. It was the belief of John Calvin that material prosperity was a sign that one belonged to the “saved.” When the centuries-old prohibition against usury was thrown out in his system, it lay the groundwork for rapid accumulation of wealth at other’s expense. This, along with the seizing of Church lands during the reign of England’s Henry VIII, were the foundation for capitalism to build on. This “hatred and contempt for one’s neighbor,” the peasantry and craftsman who held onto Catholicism and the old ways, sowed anger and misery in many memories. Over time, the fruit of it became the poison of socialism. As the 19th Century rolled on, Europe roiled under the twin burdens of excess wealth and excess poverty. With the rise of the Communists and their spokesmen Marx and Engels, the bloodletting against real and perceived persecution of the poor rose. Both private property and the market economy, though distorted by the ideas of men like Adam Smith and David Ricardo, were seen as the very source of the common man’s misery. A state where the government controlled all and supplied all needs was seen as its cure. But the very rich whom the socialists strove against where also the very ones who, more often than not, supported and financed Socialist ideas. Engels himself came from a wealthy family and supported the lazy Marx and his suffering family. In time, the fortunes of the Rockefeller and Carnegie families in America would go to fund causes promoting monopolization, eugenics and population control. Again, “inordinate self-love” by this self-proclaimed elite manipulated the poor as if they were toys. And, they claimed, for the poor’s own good. 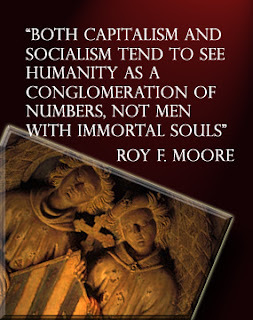 Both capitalism and socialism tend to see humanity as a conglomeration of numbers, not men with immortal souls. The one treats men as “units of production and consumption“, potential markets to tap into, customers with needs to fill at the lowest cost possible. The other treats men as only the “oppressed masses“, drugged by religion and exploited by bosses, in need of a revolutionary vanguard, either Marxist or Fabian, to lead it into a glorious classless society. Both are materialistic systems, full of themselves and empty of God, Who is considered an dangerous illusion by one and an extraneous add-on by the other. Both desire to envelop the globe with their influence, with every society colored in a monotone of dull socialist brick red or a brash, unnatural capitalist electric blue. All growing larger and more powerful, certain of triumph, convinced of never making mistakes or at least huge ones. Pride is at the core of both. But Distributism believes in limits, treasures the small, cherishes the common pleasures of the common man. In the language of Tolkien’s Lord of the Rings, it prefers the Shire to Mordor. It holds that small government and small businesses, fair trade and family farms, a clean Earth, big families and frugal comfort are more natural to man than mansions and empires. The local is preferred to the global. All is based on humility, contentment and gratitude for what we have from the hand of God. 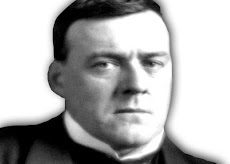 "There cannot be a nation of millionaires, and there never has been a nation of Utopian comrades; but there have been any number of nations of tolerably contented peasants." Pride and world systems based on it dissolve nations. 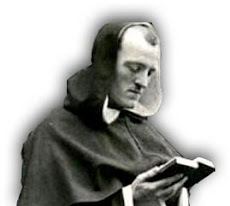 Humility – in which Distributism finds its roots - preserves and sustains nations because it preserves and sustains the family and the home.